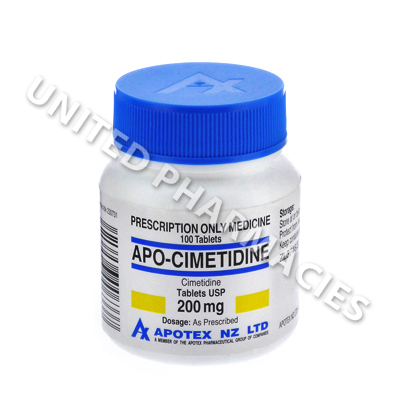 Apo-Cimetidine (Cimetidine) is used to treat and prevent duodenal, peptic and other types of ulcers. Other conditions related to excess stomach acid production, such as Zollinger-Ellison syndrome are also treated with this medicine. Apo-Cimetidine (Cimetidine) is used to treat and prevent duodenal, peptic and other types of ulcers. Other conditions related to excess stomach acid production, such as Zollinger-Ellison syndrome are also treated with this medicine. This drug is a type of H2 blocker, and it acts on certain receptors in the stomach to prevent the production of stomach acid. Reducing stomach acid has a number of benefits. Stomach ulcers can form if large amounts of stomach acid are produced. As well as this, the acid may flow backwards into the oesophagus, causing pain and irritation. Reducing stomach acid production helps to stop acid flowing back to the oesophagus, thereby preventing acid reflux. It can also help with the healing process of ulcers, while at the same time preventing them from reforming. Indigestion can also be prevented as a result of less stomach acid. Apo-Cimetidine (Cimetidine) tablets are used to treat a broad range of conditions related to excess stomach acid production. As a result of this, many different dosage regimens are possible, and your doctor will tell you the correct amount to take, based on the condition you are treating. Erosive oesophagitis or gastro oesophageal reflux disease may require 800mg taken twice per day (or 400mg 4 times per day). Zollinger-Ellison syndrome is commonly treated with 300mg 4 times per day (when used for this condition, it is normally taken alongside food). Treating dyspepsia usually requires 200mg taken 30 minutes before eating, with a maximum of 2 doses taken per day. The dosage for other conditions can vary greatly. All patients must only take the amount prescribed by their doctor. Tell your doctor about any side effects you experience. Serious side effects can also occur, and you will need urgent medical care if this happens. Examples include hallucinations, blisters on the skin and changes in urination patterns. The list of symptoms given here is not complete, and other side effects may also occur. If you suffer from HIV or any diseases affecting the liver or kidneys, you must tell your doctor before you take this medication. Patients who take antacids must tell their doctor. They may be told to take them 2 hours before taking this medicine. Always use Apo-Cimetidine (Cimetidine) as you have been prescribed by your doctor. Never self-medicate or change your dosage without first consulting your doctor. The correct dosage can vary depending on your health, medical history, and the severity of the condition being treated.